At the time that the Acura NSX made its debut on the North American market, it had the dubious distinction of being the most expensive Japanese car on the roads. That was back in 1990 when it debuted as a 1991 model. This price was no deterrent and the popularity of the new sports car took off. Sales were so strong that many dealers sold them over the sticker price. For all its popularity, the vehicle didn't achieve the same sales levels as the competition. The original Acura NSX had a mid-engine design with a 3.0 L V6 engine featuring dual overhead cams and variable valve timing that produced 270 hp. The early NSX coupes had a five-speed manual transmission as the only gearbox, but after just a few months a 4-speed automatic transmission option was introduced. Changes over the years include new passenger side airbags and seatbelt pretensioners, along with a small redesign of the central console. By 1994, the tires went up in size. The upholstery also switched to having leather seating as standard, and came in three colors - black, tan or white. The next year, in 1995, the NSX-T (the T stands for targa, which means that the car featured a lift-off metal roof) model was released. The removable roof panel was stored behind the seats. Some structural changes had to be made to reach the new side-impact regulations. Another change was the SportShift feature for the automatic transmission. By 1997, the NSX gained a second bigger engine, a 3.2 L aluminum V6 and a 6 speed manual transmission. This engine increased the horsepower to 290 hp. There were minimal to no changes in 1998 and 1999 with the exception of the release of a limited-production Alex Zanardi Edition in 1999 - a fixed roof coupe. For the 10th anniversary in 2000, the 2 seater model had the upholstery updated with leather trim on the seats, steering wheel and even on the door panels. The manual shift action was improved as well. 2001 saw a couple of minor changes like carpeted floor mats and an emergency trunk release. It was only in 2002 that more major changes happened. 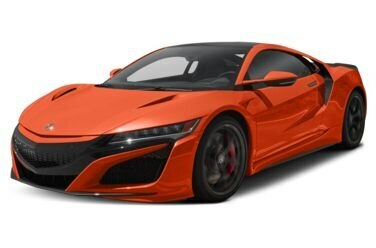 The fixed roof model was discontinued, and the NSX-T received Xenon headlamps, larger exhaust ports, wider rear tires and an updated suspension. Also at this time a four-speed automatic transmission with a new manual shift feature was introduced. Between now and the end of its run in 2005, the only change was the addition of keyless entry. The reason, apparently, behind the discontinuation had more to do with the amount of money and time required to bring the vehicle up to the new emission and equipment regulations that were implemented in 2006 than with poor sales. This car was everything a sports car should be: low, slinky and exotic. It held its own nicely against the other exotics, which were its main competition. The new aluminum body panels saved weight while the engine, based on a Formula One race car, offered speed and performance. The Acura NSX wasn’t just about looks and performance. This was a vehicle that offered comfort, styling and came loaded with convenience and safety features. Standard on this vehicle was leather upholstery, air conditioning, a tilt steering wheel, and automatic climate control. Also included as standard was a 4 speaker Bose stereo system and a full complement of power accessories, including windows and locks. The Acura NSX comes standard with several safety features like four-wheel ABS, traction control, Child Seat Lower Anchorage, pretensioner, trunk release, and electronic traction control via ABS & engine management. There are no government crash test results available for this vehicle.